"Noel Mewton-Wood (20 November 1922 – 5 December 1953) was an Australian-born concert pianist who achieved some fame during his short life. Born in Melbourne, he studied at the Melbourne Conservatorium until the age of fourteen. After further studies at London's Royal Academy of Music, Mewton-Wood spent time with Artur Schnabel in Italy. In March 1940, he returned to London for his début performance at Queen's Hall, performing Beethoven's Third Piano Concerto with the London Philharmonic Orchestra under Sir Thomas Beecham. He later performed in France, Germany, South Africa, Poland, Turkey and Australia. At the age of thirty-one, Mewton-Wood committed suicide apparently blaming himself for the death of a friend. 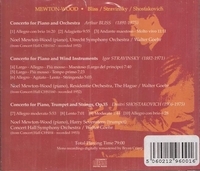 The notes written by a friend of Mewton-Wood, John Amis, for the reissue of the Bliss Concerto recording, indicate that Mewton-Wood was gay and was depressed by the recent death of his lover. Mewton-Wood had been a close friend of Benjamin Britten, who wrote 'Canticle III: Still falls the rain' for his memorial concert."